Peru is an equatorial country in western South America, bordering Ecuador, Colombia, Brazil, Chile, and Bolivia. The historic home of the Inca civilization, Peru attracts many tourists who visit the historic sites such as Machu Picchu and Sacsayhuamán near Cuzco. Peru is the fifth most populous country in Latin America (after Brazil, Mexico, Colombia and Argentina). Twenty-one cities have a population of 100,000 or more. Rural migration has increased the urban population from 35.4% of the total population in 1940 to an estimated 74.6% as of 2005. Most Peruvians are either Spanish-speaking mestizos—a term that usually refers to a mixture of indigenous and European/Caucasian—or Amerindians, largely Quechua-speaking indigenous people. Peruvians of European descent make up about 15% of the population. There also are small numbers of persons of African, Japanese, and Chinese ancestry. Socioeconomic and cultural indicators are increasingly important as identifiers. For example, Peruvians of Amerindian descent who have adopted aspects of Hispanic culture also are considered mestizo. With economic development, access to education, intermarriage, and large-scale migration from rural to urban areas, a more homogeneous national culture is developing, mainly along the relatively more prosperous coast. Peru's distinct geographical regions are mirrored in a socioeconomic divide between the coast's mestizo-Hispanic culture and the more diverse, traditional Andean cultures of the mountains and highlands. The president is popularly elected for a five-year term. A constitutional amendment passed in 2000 prevents reelection. The first and second vice presidents also are popularly elected but have no constitutional functions unless the president is unable to discharge his duties. The principal executive body is the Council of Ministers, comprised of 15 members and headed by a prime minister. The president appoints its members, who must be ratified by the Congress. All Executive laws sent to Congress must be approved by the Council of Ministers. The legislative branch consists of a unicameral Congress of 120 members. In addition to passing laws, Congress ratifies treaties, authorizes government loans, and approves the government budget. The judicial branch of government is headed by a 16-member Supreme Court. The Constitutional Tribunal interprets the constitution on matters of individual rights. Superior courts in departmental capitals review appeals from decisions by lower courts. Courts of first instance are located in provincial capitals and are divided into civil, penal, and special chambers. The judiciary has created several temporary specialized courts in an attempt to reduce the large backlog of cases pending final court action. In 1996 a human rights ombudsman's office was created. 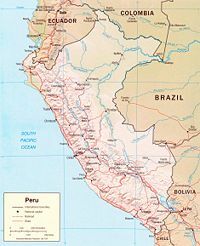 Peru is divided into 25 regions. The regions are subdivided into provinces, which are composed of districts. High authorities in the regional and local levels are elected. The country's latest decentralization program is in hiatus after the proposal to merge departments was defeated in a national referendum in October 2005. Peru generally enjoys friendly relations with its neighbors. In November 1999, Peru and Chile signed three agreements that put to rest the remaining obstacles holding up implementation of the 1929 Border Treaty. (The 1929 Border Treaty officially ended the 1879 War of the Pacific.) In late 2005, a declaration of maritime borders by Peru's Congress set off a new round of recriminations with Chile, which claims that the maritime borders were agreed to in fishing pacts dating from the early 1950s. In contrast, the Garcia administration has recently made overtures to Chile, aimed at improving that relationship. In October 1998, Peru and Ecuador signed a peace accord to resolve once and for all border differences that had sparked violent confrontations. Peru and Ecuador are now jointly coordinating an internationally sponsored border integration project. The U.S. Government, as one of four guarantor states, was actively involved in facilitating the 1998 peace accord between Peru and Ecuador and remains committed to its implementation. The United States has pledged $40 million to the Peru-Ecuador border integration project and another $4 million to support Peruvian and Ecuadorian demining efforts along their common border. In 1998, Peru became a member of the Asia-Pacific Economic Cooperation (APEC) forum, facilitating closer ties and economic relations between Peru and Asian nations. Peru will host the APEC Summit in 2008. Peru has been a member of the United Nations since 1949, and is a member of the Security Council. Peruvian Javier Perez de Cuellar served as UN Secretary General from 1981 to 1991. Peru maintains 210 troops in peacekeeping operations in Haiti under the UN's MINUSTAH. Peru's economy has shown strong growth over the past five years, helped by market-oriented economic reforms and privatizations in the 1990s, and measures taken since 2001 to promote trade and attract investment. GDP grew 8.0% in 2006, 6.7% in 2005, 4.8% in 2004, 4.0 in 2003, and 4.9% in 2002. President Alan Garcia and his economic team have continued these policies. GDP is projected to grow by more than 7% in 2007. Recent economic expansion has been driven by construction, mining, export growth, investment, and domestic demand. Inflation is projected to remain under 2% in 2007, and the fiscal deficit is only 0.6% of GDP. In 2006 external debt decreased to $28.3 billion, and foreign reserves were a record $17.3 billion at the end of 2006. Peru's economy is well managed, and better tax collection and growth are increasing revenues, with expenditures keeping pace. Private investment is rising and becoming more broad-based. The government has had success with recent international bond issuances, resulting in ratings upgrades. The Garcia administration is studying decentralization initiatives, and is focused on bringing more small businesses into the formal economy. Peru and the U.S. signed the U.S.-Peru Trade Promotion Agreement (PTPA) on April 12, 2006 in Washington, DC. The PTPA was ratified by the Peruvian Congress on June 28, 2006, but has not yet been ratified by the U.S. Congress. On December 9, 2006, the U.S. Congress extended the Andean Trade Preference Act (ATPA) as amended by the Andean Trade Promotion and Drug Eradication Act (ATPDEA)--jointly referred to as ATPA/ATPDEA—through June 2007. On June 30, 2007 the President signed legislation extending ATPA/ATPDEA for an additional 8 months. Peru registered a trade surplus of $8.8 billion in 2006. Exports reached $23.7 billion, partially as a result of high mineral prices. Peru's major trading partners are the U.S., EU, Chile and Japan. In 2006, 23.0% of exports went to the U.S. ($5.9 billion) and 16.0% of imports came from the U.S. ($2.9 billion). Exports include gold, copper, fishmeal, petroleum, zinc, textiles, apparel, asparagus and coffee. Imports include machinery, vehicles, processed food, petroleum and steel. Peru belongs to the Andean Community, the Asia-Pacific Economic Cooperation (APEC) forum, and the World Trade Organization (WTO). The Peruvian Government actively seeks to attract both foreign and domestic investment in all sectors of the economy. The registered stock of foreign direct investment (FDI) is over $15.4 billion, with the U.S., Spain, and the United Kingdom the leading investors. FDI is concentrated in telecommunications, mining, manufacturing, finance and electricity. Peru is a source of both natural gas and petroleum. In August 2004, Peru inaugurated operations of the Camisea natural gas project. Camisea gas is fueling an electricity generator and six industrial plans in Lima, with other facilities in the process of switching to gas. In a second phase, liquefied natural gas (LNG) will be exported to the west coast of the United States and Mexico. The gas and condensates from Camisea are equivalent to some 2.4 billion barrels of oil, approximately seven times the size of Peru's proven oil reserves. The Camisea project, when completed, is expected to gradually transform Peru's economy, catalyze national development and turn Peru into a net energy exporter. Peru is the world's second-largest producer of silver, sixth-largest producer of gold and copper, and a significant source of the world's zinc and lead. Mineral exports have consistently accounted for the most significant portion of Peru's export revenue, averaging around 50% of total earnings from 1998 to 2005 and 62% in 2006. When the Spanish landed in 1531, Peru's territory was the nucleus of the highly developed Inca civilization. Centered at Cuzco, the Incan Empire extended over a vast region from northern Ecuador to central Chile. In search of Inca wealth, the Spanish conqueror Francisco Pizarro, who arrived in the territory after the Incas had fought a debilitating civil war, conquered the weakened people. The Spanish captured the Incan capital at Cuzco by 1533, and consolidated their control by 1542. Gold and silver from the Andes enriched the conquerors, and Peru became the principal source of Spanish wealth and power in South America. Pizarro founded Lima in 1535. The viceroyalty established at Lima in 1542 initially had jurisdiction over all of the Spanish colonies in South America. By the time of the wars of independence (1820–24), Lima had become one of the most distinguished and aristocratic colonial capital and the chief Spanish stronghold in the Americas. Peru's independence movement was led by Jose de San Martin of Argentina and Simon Bolivar of Venezuela. San Martin proclaimed Peruvian independence from Spain on July 28, 1821. Emancipation was completed in December 1824, when Venezuelan General Antonio Jose de Sucre defeated the Spanish troops at Ayacucho, ending Spanish rule in South America. Spain subsequently made futile attempts to regain its former colonies, but in 1879 it finally recognized Peru's independence. After independence, Peru and its neighbors engaged in intermittent territorial disputes. Chile's victory over Peru and Bolivia in the War of the Pacific (1879–83) resulted in a territorial settlement in which Peru ceded the department of Tarapaca and the provinces of Tacna and Arica to Chile. In 1929, Chile returned Tacna to Peru. Following a clash between Peru and Ecuador in 1941, the Rio Protocol—of which the United States is one of four guarantors (along with Argentina, Brazil and Chile)--sought to establish the boundary between the two countries. Continuing boundary disagreement led to brief armed conflicts in early 1981 and early 1995, but in 1998 the governments of Peru and Ecuador signed an historic peace treaty and demarcated the border. In late 1999, the governments of Peru and Chile likewise implemented the last outstanding article of their 1929 border agreement. Peru and Chile still dispute the sea boundary. Mujer de Jauja by Adrian Airaldi, ca. 1975. The military has been prominent in Peruvian history. Coups have repeatedly interrupted civilian constitutional government. The most recent period of military rule (1968–80) began when Gen. Juan Velasco Alvarado overthrew elected President Fernando Belaunde Terry of the Popular Action Party (AP). As part of what has been called the "first phase" of the military government's nationalist program, Velasco undertook an extensive agrarian reform program and nationalized the fishmeal industry, some petroleum and mining companies, and several banks. Because of Velasco's economic mismanagement and deteriorating health, he was replaced in 1975 by Gen. Francisco Morales Bermudez. Morales Bermudez tempered the authoritarian abuses of the Velasco administration and began the task of restoring the country's economy. Morales Bermudez presided over the return to civilian government under a new constitution and in the May 1980 elections, President Belaunde Terry was returned to office by an impressive plurality. Nagging economic problems left over from the military government persisted, worsened by an occurrence of the "El Niño" weather phenomenon in 1982-83, which caused widespread flooding in some parts of the country, severe droughts in others, and decimated the fishing industry. The fall in international commodity prices to their lowest levels since the Great Depression combined with the natural disasters to decrease production, depress wages, exacerbate unemployment, and spur inflation. The economic collapse was reflected in worsening living conditions for Peru's poor and provided a breeding ground for social and political discontent. The emergence of the terrorist group Sendero Luminoso (Shining Path) in rural areas in 1980—followed shortly thereafter by the Tupac Amaru Revolutionary Movement (MRTA) in Lima—sent the country further into chaos. The terrorists were financed in part from alliances with narcotraffickers, who had established a stronghold in the Peruvian Andes during this period. Peru and Bolivia became the largest coca producers in the world, accounting for roughly four-fifths of the production in South America. Amid inflation, economic hardship, and terrorism, the American Popular Revolutionary Alliance (APRA) won the presidential election in 1985, bringing Alan García Pérez to office. The transfer of the presidency from Belaunde to García on July 28, 1985, was Peru's first transfer of power from one democratically elected leader to another in 40 years. Economic mismanagement by the García administration led to hyperinflation from 1988 to 1990. Concerned about the economy, the increasing terrorist threat from Sendero Luminoso, and allegations of official corruption, voters chose a relatively unknown mathematician-turned-politician, Alberto Fujimori, as president in 1990. Fujimori felt he had a mandate for radical change. He immediately implemented drastic economic reforms to tackle inflation (which dropped from 7,650% in 1990 to 139% in 1991), but found opposition to further drastic measures, including dealing with the growing insurgency. On April 4, 1992, Fujimori dissolved the Congress in the "auto-coup," revised the constitution, and called new congressional elections. With a more pliant Congress, Fujimori proceeded to govern unimpeded. Large segments of the judiciary, the military and the media were co-opted by Fujimori's security advisor, the shadowy Vladimiro Montesinos. The government unleashed a counterattack against the insurgency that resulted in countless human right abuses and eventually quashed the Shining Path and MRTA. During this time he also privatized state-owned companies, removed investment barriers and significantly improved public finances. Fujimori's constitutionally questionable decision to seek a third term, and subsequent tainted electoral victory in June 2000, brought political and economic turmoil. A bribery scandal that broke just weeks after he began his third term in July forced Fujimori to call new elections in which he would not run. Fujimori fled the country and resigned from office in November 2000. A caretaker government under Valentin Paniagua presided over new presidential and congressional elections in April 2001. The new elected government, led by President Alejandro Toledo, took office July 28, 2001. The Toledo government successfully consolidated Peru's return to democracy, a process that had begun under President Paniagua. The government undertook initiatives to implement the recommendations made by the Truth and Reconciliation Commission (TRC), which had been charged with studying the circumstances surrounding the human rights abuses and violations committed between 1980 and 2000. Criminal charges for corruption and human rights violations were brought against former President Fujimori, who is in Chile fighting efforts to extradite him to Peru. Despite being a frequent target of media criticism, Toledo maintained strong commitments to freedom of the press. Under President Toledo, Peru signed a Trade Promotion Agreement (TPA) with the U.S., to replace the Andean Trade Preferences and Drug Eradication Act, which was due to expire in December 2006. Toledo also unveiled the construction of a road that will connect Brazil and Peru's isolated interior to the Pacific coast. Toledo's economic management led to an impressive economic boom in Peru that remains strong. Poverty reduction has been uneven, however. Although poverty in some areas has decreased by up to 37% over the last five years, nationally it has only decreased by 5% and over half of Peruvians are still considered to be living below the poverty line (living on less than $2 a day). In 2005 the government implemented "Juntos," a program to double the income of people living under extreme poverty (less than $1 a day). On June 4, 2006, APRA candidate Alan García Pérez was elected to the presidency by 52.5% of the voters in his runoff with Ollanta Humala, who ran under the Union for Peru, with the support of his Peruvian Nationalist Party. With 36 seats, APRA has the second largest bloc—next to the Union for Peru Party's 45 seats—in the 120-seat unicameral Congress which was sworn in July 2006. After a disappointing presidential term from 1985 to 1990, García returned to the presidency with promises to improve Peru's social condition, balancing economic stability with increased social spending. His stated primary goal is to decrease poverty through job creation, especially in Peru's southern highlands where poverty is most acute. He has sought to improve relations with Peru's South American neighbors and with the United States, and to present Peru's democratic and pro-free trade path as a model for the region. This page was last modified on 1 April 2017, at 08:16. This page has been accessed 55,820 times.